AHAs and BHAs // Why you should be using them! I was quite fortunate as a teenager that bad skin was never a problem, until I hit 24 when adult acne started and I have become concerned with aging and preventing it! That's when I discovered AHAs and BHAs. 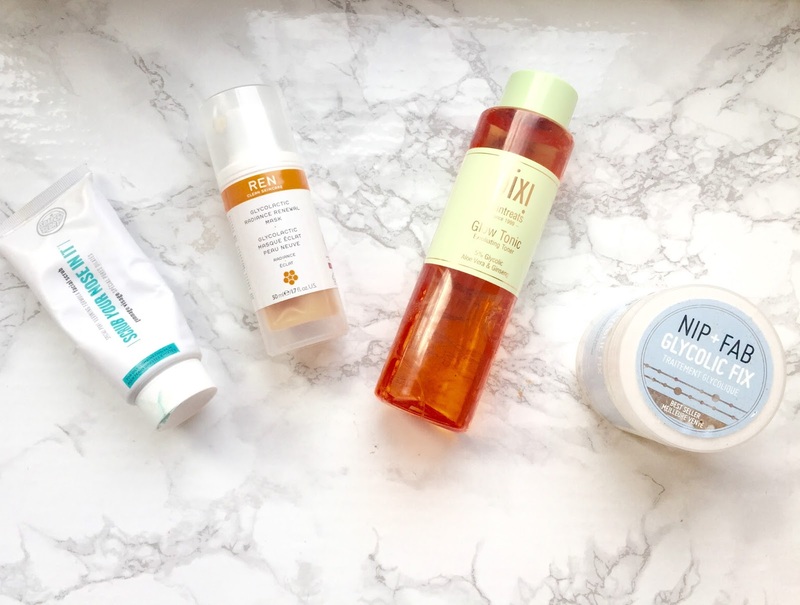 AHAs, or Alpha Hydroxy Acids are becoming a massive part of the beauty industry with almost every brand bringing out products that contain them. But what exactly are they you may ask? Well, AHAs are derived from fruit and milk and are sometimes listed as glycolic and / or latic acid. These acids help break down dead skins to reveal, fresh glowy, radiant skin. They also help improve and prevent wrinkles and fade dark spots. In short, they are basically chemical exfoliators. For products to really work and transform the skin you want to find one that contains around 4-5% of the AHA and use it around twice a week. AHAs have been know to increase the skins sensitivity to sun light! So bare this in mind and apply an SPF. A cult classic, and for good reason! Enriched with glycolic acid this helps brighten, tone and fade marks, all in one easy step! It contains horse chestnut to boost blood flow and witch hazel to help tone! This is effective and gentle at the same time, so it can be used by all skin types. I apply this to a cotton pad and wipe over my face after cleansing in the morning and evening. This is instantly refreshing and leaves my skin really smooth. I've also noticed an improvement in the dehydration lines on my forehead since using this, so it's definitely doing its job! These are very similar to the PIXI Glow Tonic but in a pre soaked pad form. These promise retexture and unveil younger fresher looking skin. With added hyaluronic acid and witch hazel to help moisturise and tone. I use these after cleansing and they do leave my skin feeling super soft and smooth! This combines a manual scrub and a chemical exfoliants in one for a superb clean! This helps lift away dead cells, soak up excess oils and stimulate blood supply to the face. This says it formulated for oily to combination skin. I wouldn't say my skin is oily but can be slightly combination at times and I absolutely love this! It leaves my skin feeling super clean and fresh! I use this 3 times a week, in the usual 'scrub way' and then leave it on for 2 minutes before rinsing away and leaving behind brilliantly, clean, smooth skin! This is similar to the PIXI Glow Tonic but in a concentrated mask form. This promises to deep clean, help comeback congestion, reduce blackheads, reduce the appearance of fine lines. For brighter younger looking skin. Sounds like a miracle in a bottle doesn't it? And it REALLY is! The best face mask I have ever used. The consistency is very thick, like jam. I smother this all over my face and leave it on for 15 minutes. The results are instant. After removal I'm left with brighter, smoother and just better looking skin in general. This is pricy but well worth every penny! What are your top AHA and BHA products? I'm looking for a cheaper dupe of the REN mask, so let me know if you know of any!